There is nothing quite like slipping into hot, bubbly water and feeling the soothing motion of jets after a long day. In fact, many people describe soaking in a hot tub as a time of magical joy and pure bliss. If you are on the fence about whether or not to take the plunge and buy a new hot tub for your backyard, read on to hear our list of reasons why you should. There are many reasons why people invest in hot tubs for their home. Some people are looking for a reprieve from the winter cold, others want to relax after a long day at work. But regardless of your reason for wanting a hot tub, you probably are not aware of all the health benefits that a hot tub can provide you. The obvious health benefit is stress relief. In fact, this is the number one reason why people buy hot tubs for their home, they are looking for a way to de-stress and escape. 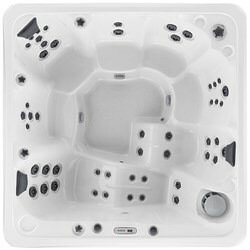 Whether you hop in the hot tub alone or with friends, sipping on a cocktail or an iced water, enjoying the sun or the moon-your hot tub will help you to slip into a state of total relaxation. Your time in your spa presents the perfect occasion to put your smart phone away and get into that book you’ve been meaning to read for ages. Or maybe you want to take the time to meditate and enjoy some quiet down time. No matter how you choose to relax, doing so in a hot tub only enhances the experience. By immersing yourself in hot water, you are not only allowing the tension in your muscle to release, but your overall stress will release as well. Along with reduced stress, you will start to feel a heightened sense of overall well-being. Think of it this way, whenever we are sick, tired, stressed, sore, or just overall not ourselves, the advice that we often hear is to take a hot bath. It’s something that we have all used to soothe and comfort ourselves from childhood into adulthood. In addition to helping us unwind and de-stress, a good soak in your hot tub an hour and a half to two hours before bedtime can improve your sleep. Let’s face it, whether you suffer from insomnia or just the occasional restless night, a bad night of sleep can ruin your entire next day. By partaking in just a 15 minute dip in your hot tub before bed, you raise your body temperature and then rapidly cool it down afterwards. This action relaxes you and helps you to ease your mind and body into a deep, restful sleep. Research has shown that being in an environment in which the temperature is elevated (like a hot tub) can help to stimulate your body’s natural process of producing white blood cells. White blood cells are your natural defense against infection, disease and viruses. With an abundance of white blood cells in your body you increase your chances of fighting off illness before it has a chance to get you sick. If you do find yourself with a cold or other respiratory ailment, your hot tub is the perfect place to help you breathe better. Inhaling the hot water will quickly break up anything in your airways that is restricting your airflow. It works to open up your airways so that you can breathe in deeper and fuller breaths. Soaking in hot water has been known to relieve the pain from some common illnesses such as fibromyalgia and arthritis. Additionally, many runners and athletes find that a good soak after a tough workout is extremely beneficial in easing any discomfort in their bodies. Hot water assists in reducing the amount of inflammation in the body thanks to the improved circulation that it promotes. Regular soaks in the hot tub can also help improve your flexibility and help slow down the natural stiffening that comes with aging. You can even do some gentle exercises in your hot tub while your muscles are warm and pliable, helping to tone your body and increase your strength and flexibility. Besides all of the amazing health benefits that adding a hot tub to your backyard give you, it also provides you with a great opportunity to revamp your outdoor space. The possibilities are endless when it comes to installing a hot tub in your outdoor space. You can truly customize your hot tub and the surrounding area to create the calming oasis you’ve always dreamed of. Hot tubs come in all kinds of shapes and sizes. You can choose how big you want yours, the color, the number and type of jets, LED lighting, and more. With the addition of the right furniture and surrounding accents, your hot tub can be the highlight and feature of your entire space. Once you have the backyard of your dreams, you can sit back and relax while enjoying the natural world around you-something that many of us don’t take the time to do in our ever busy lives. Perhaps one of the greatest benefits and joys of adding a hot tub to your backyard is the opportunity to spend more quality time with friends and loved ones. With the addition of a hot tub to your backyard, everyone will have the opportunity to relax and unwind while enjoying each other’s company without the distraction of cell phones and other devices. Whether you want to add a hot tub to your outdoor space to be a relaxing personal oasis, a family gathering place, or party spot, you have the opportunity to design the perfect hot tub to fit your style and vision.